Stay With Me now has an official airdate! The drama has had various tentative dates, but the official drama Weibo account posted the picture above and announced that the drama will start airing on 14 December on Hunan Satellite TV and online with Golden Eagle TV, and several other streaming sites. 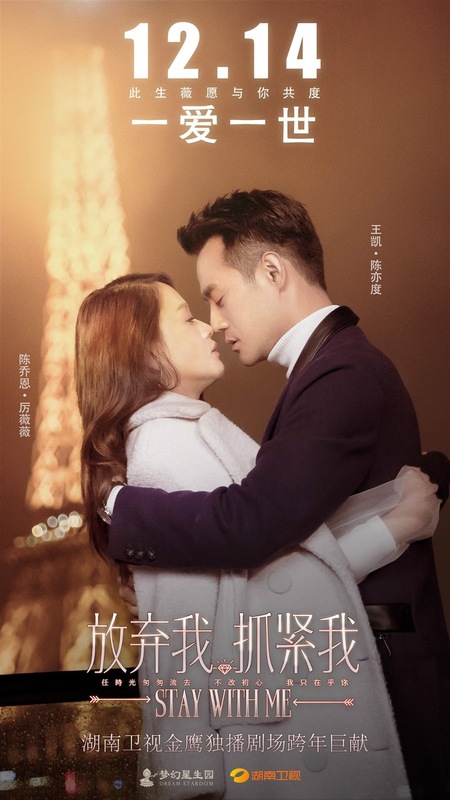 The TV show stars Wang Kai as Chen Yidu, a seemingly ice-cold CEO of a fashion design company, and Joe Chen as Li Weiwei (Vivian), also a fashion designer. Due to a drowning accident, Weiwei loses her memory, including that of her first love, Chen Yidu. For more information on the cast and synopsis, check out this post and also click on the drama tag below for other related posts including this one with the trailer. DramaFever has the license to sub the drama, and right now there is only a fan channel on Viki, but please request the license here. We know that not all fans live in the Americas where DramaFever shows dramas to. We also know that not all fans have access to Viki either, so we will try and post any legal streaming options that we can. Please also enjoy a few pictures posted on Weibo. Wouldn’t we all love a warm hug from Kaikai?! Are you looking forward to this drama and to seeing Wang Kai as a romantic lead?